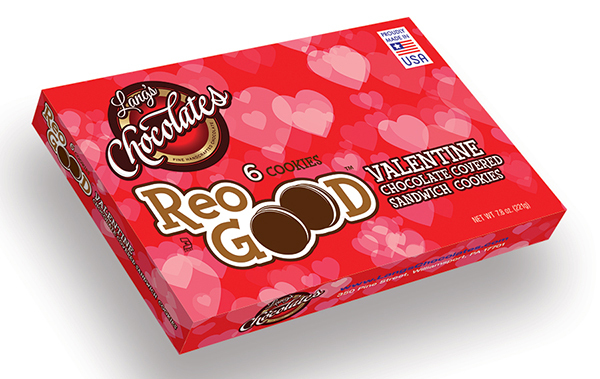 Lang’s Chocolates asked us to help them create distinctive branding for their new ReoGood™ chocolate-covered sandwich cookies. Our solution called for fun and friendly typography. Taking advantage of the double “O”s in their new brandname, our logo design illustrates a pair of chocolate-encased sandwich cookies, accurately depicting both the type and the quantity of cookies contained in each packet. With a limited palette of 5 spot colors, including white, we design a pair of flow wrap bags using a color scheme that enabled us to highlight both dark chocolate and milk chocolate varieties. We chose a contrasting aqua color to use in the background and took advantage of the flow wrap film’s reflective silver color.